The Abbott Marshlands are a mosaic landscape of wetlands and uplands. 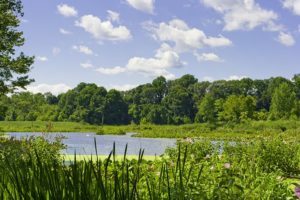 Marsh and swampland are interspersed with meandering streams and channels, and there are ponds and pond-like areas created by beaver dams. Wooded uplands occur along the slopes of the bluffs that surround the marsh. 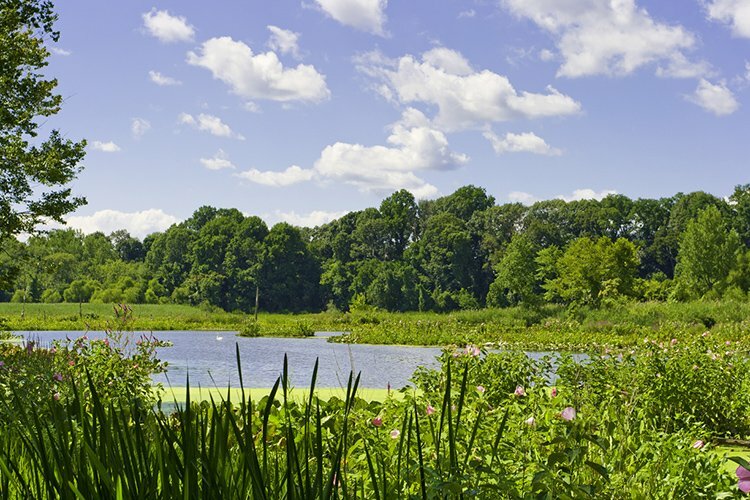 This varied landscape with its tidal and non-tidal wetlands and uplands provides habitats for many kinds of organisms, including microbes, fungi, fish, frogs, birds, and plants. Of the approximately 3000 acres, which make up the area referred to here as the Marshlands, about 1250 acres are wetlands. Approximately half of the wetland area is tidal, comprising the northernmost tidal freshwater wetland on the Delaware River. Tides occur here because the Delaware River is tidal as far north as Trenton. To check tides click here. Tidally influenced habitats at the Marshlands include: rivers, creeks and smaller channels; marshes, which are dominated by herbaceous (non-woody) plant species; and swamps that can be an almost impenetrable mix of trees, shrubs, and herbaceous plants. 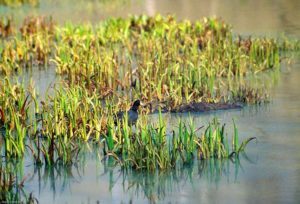 Non-tidal wetlands include ponds, as well as marshes and swamps. Away from the influence of tides or the presence of standing water and at higher elevations are upland forests. These surround the Marshlands on the north, east, and south sides. (The Delaware River is on the western side). There are also forested islands within the wetland that rarely or never flood even when there is significant flooding of the Delaware River. In addition to these primarily natural habitats, there are disturbed areas along roadsides, the reclaimed landfill, and the created wetland on Duck Island. These also add to the diversity of habitats and Marshland inhabitants. Across the Marshlands are gradients of conditions. Examples include water depth, the duration of tidal inundation, and the interaction between these two factors. Changing conditions can be seen in looking from the deeper water in the center of a creek, across to low marsh and then high marsh, and as the water inundation gradually decreases, to shrub thickets, swamp, and wet woods, and finally to the drier forested uplands. As elevation increases, any tidal influence also decreases. Plant and animal species have evolved varying abilities to tolerate water inundation. 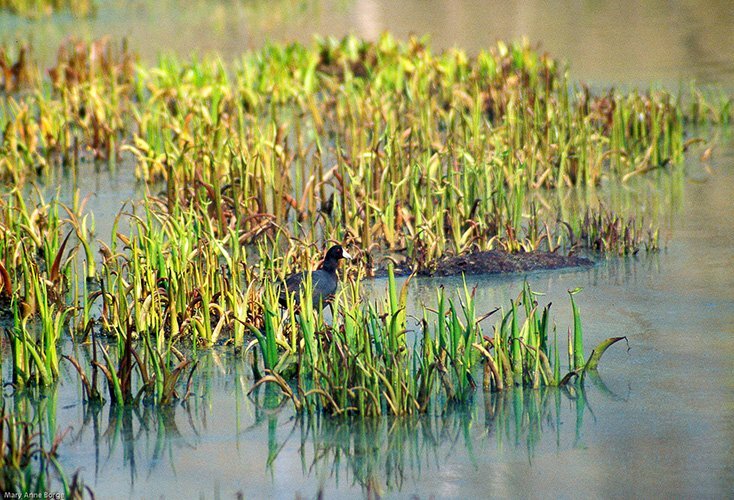 Wild Rice grows in marshes or shallow ponds where soil is continuously submerged. Jewelweed can thrive in high marsh locations where soils are not continuously submerged, as well as in moist woodlands, but it can’t survive in the wet soils required by Wild Rice. Red-winged Blackbirds range over marsh and swampland, while Warbling Vireos are typically found in trees near the waters edge. Such diversity in adaptations makes possible a broad range of species in each habitat. Tides have profound effects. 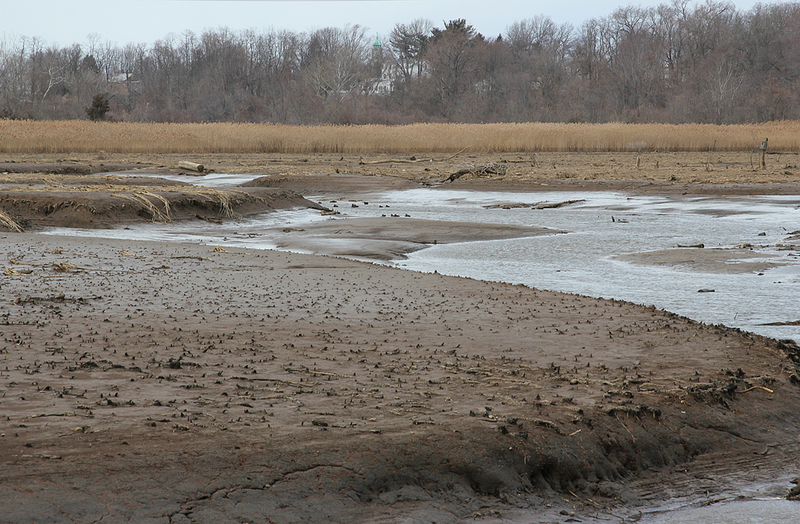 Although continuously wet, tidal wetland soils are drained twice a day, making sufficient oxygen available for decomposition of plant debris. The nutrients released by this decomposition are readily available to plants, allowing the development of lush vegetation that in turn provides food and shelter for animals. 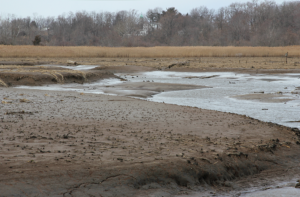 Under these conditions of ample nutrients and water, the amount of plant material produced per acre yearly makes tidal freshwater marshes one of the most productive ecosystems in the world. For more information on habitats click here and see Resources.